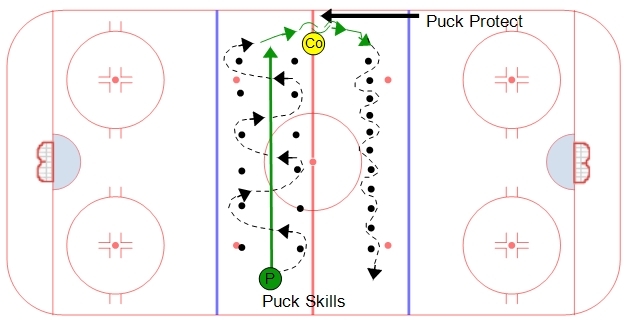 This station has three areas that can be set up for stickhandling drills, puck protection techniques, and puck skills. The station is set up in the neutral zone. The first station has large movements where players maintain puck possession. Next the players use a puck protection technique along the wall. The third drill is for player to work on quick hands. In the first station players should keep both hands on the stick at all times and cradle the puck around the pucks to the outside. The players should use their inside edges to maintain good center of balance and roll their wrist to cradle the puck. When they get to the wall players need to protect the puck along the wall from the coach. Make sure players use their body to protect the puck and encourage players to play the puck off the wall if needed. The third set is designed for players to work on quick hands. Again, have players maintain good center of balance on the inside edges and stickhandle as quick as they can through the pucks.